It was the unique name that piqued my interest to review Private Kitchen's latest promo. 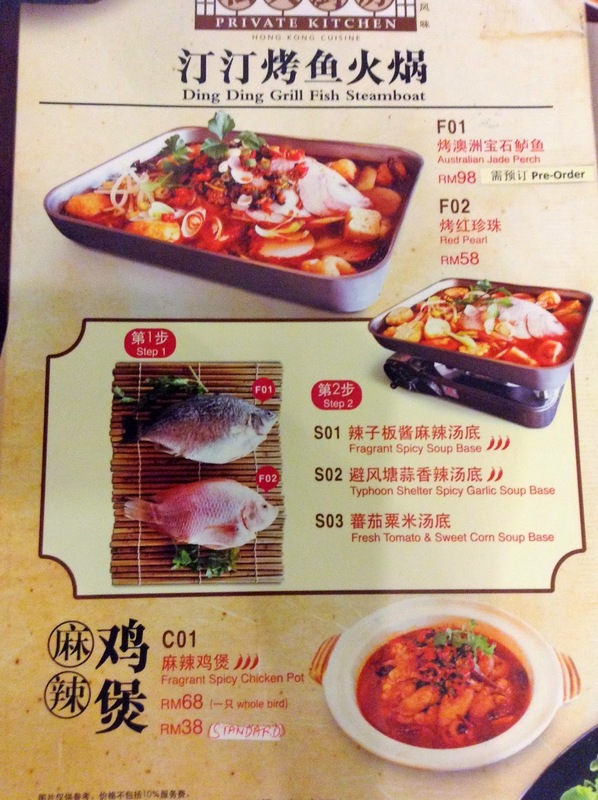 With an unusual name like Ding Ding Grill Fish Steamboat, I couldn't fathom how the exact dish looks like. Now, Hong Kong native and chef owner Lam Fai has always went against the grain with his HK-centric Chinese food and this time, he has chosen to highlight a regional Chinese-style steamboat that few of us has ever encountered. Named after Ding Ding, a freshwater fish production area in China, the one-of-a-kind steamboat features a rectangular stainless steel tray (similar to a roasting tray) imported from Japan filled with a choice of three stock base: Fragrant Spicy Soup, Typhoon Shelter Spicy Garlic Soup or Fresh Tomato & Sweet Corn Soup and fish: Australian Jade Perch (pre-order necessary at RM98) or Red Pearl (RM58). The whole fish is usually partially grilled and placed into the tray so that it would cook slowly, immersed in the broth and kept warm atop a portable gas stove. Diners can add their selection of steamboat items into the tray, making the entire combo a hefty serving of fish and different goodies. It is interesting to note how different the broths eventually turn out as the meal progresses. Also the resultant taste hinges on the types of ingredients chosen to boost the steamboat base, be it meat (RM6.90 - RM16.90 per dish), vegetables (RM4.90 & R5.90), seafood (RM4.80 - RM20), mushroom (RM5.80), noodles (RM2 - RM3.80) or others (RM1 - RM4.90). For our Ding Ding Steamboat, we had Fresh Prawn (RM20), Sea Urchin Balls (RM6.80), Pork Dumplings (RM4.90), Pork Wontons (RM4.90), Egg (RM1), Pork Belly Slices (RM11.90), Homemade Pork Meat Balls (RM6.90), Enoki Mushroom (RM5.80), Thick Beehoon (RM2), Crab Stick (RM4.80), Chicken Fillet (RM8.90), Siu Bok Choy (RM4.90), Nai Bak (RM5.90) and Beancurd Skin (RM4.90). Interestingly, no dips are provided nor was it necessary as we found the broth and all the ingredients in the steamboat became more flavourful with each passing moment. The Fragrant Spicy Soup was incredibly addictive thanks to its zesty tongue-tingling effect and tasty sweetness from a bounty of sliced zucchini, beancurd puffs, chunks of sweet corn and tomatoes, onion, chilli and garlic. The stock drew its robustness from a blend of black beans with peanuts, Sichuan peppercorns, red and green chillies and coriander. The Fresh Tomato & Sweet Corn version struck a familiar chord with its simple, uncomplicated nuances; its basic stock of pork bones, pig skin and chicken feet redolent with the warm notes of ginger and clear sweetness of radish. If you prefer more piquant overtones, the Typhoon Shelther Soup's dau pan jiong (spicy preserved bean paste), sesame oil, dried chilli and fried minced garlic mixture would set your tastebuds alight. This speciality is best savoured slowly and leisurely with family and friends, especially on a rainy day. It also calls for interactive participation from everyone around the table so stash those smartphones away and get in on the fun! Private Kitchen is now located at its new premises in SS2 - sited in the bustling stretch known as Chow Yang. The pared-down interior is functional enough to make diners feel at ease, letting them dine in air-conditioned comfort. For reservations, call tel: 03-7874 8399. PRIVATE KITCHEN is located at 20 Jalan SS 2/10, Petaling Jaya, Selangor.